An artist herself, the author brings alive the world her famous ancestor lived in, the times, the quests he would go on for, for the perfect face or image. Before reading a book, if you are in the habit of flittering through the pages, you’d spot in between the pages of Hidden Truth, Rukmini Varma’s book on her famous ancestor, italicised letters. Like the curious reader you are, you spring on them to find out if they are straight from the hand of this ancestor Kerala is so very proud about. It is, it is from Raja Ravi Varma, Rukmini’s fourth generation ancestor, the artist who made art so lovable to everyone from laymen to masters. Finding those words that he wrote had been her eureka moment, Rukmini, an artist herself, tells TNM. “It was more of creative and intuitive writing. An outsider might not be able to make much sense of these random words. But for me, it felt like my great-great grandfather was talking to me, prodding me further,” she says. Rukmini found them in the last pages of two volumes of a book that Ravi Varma had constantly referred to – The Best Works of the Royal Academy Masters. It became especially helpful since he never kept a journal. But his brother Raja Raja Varma, who accompanied him in most of his artistic journeys, did. Together with all that, there were the many tales her grandmother Sethu Lakshmi Bayi told her that she heard from her mother Mahaprabha, one of Ravi Varma’s daughters. It must be from the grandmothers that Rukmini created the background to write the first chapters of her book. Ravi Varma is then a little boy drawing on blank walls of the family house with the charcoal pieces he found from the kitchen. He knows it may not be taken well but he cannot help it – he just has to draw. There, in that first page, Rukmini introduces to you the urge that this little boy is born with, the urge to draw that would be there through his life, at good times and bad, becoming his strength and weakness. It is not clear if she is referring to the community of Varmas, or the family in particular. It is not hopefully the upper Kshatriya caste that she means in these instances. That would mean the author is glorifying one caste in particular, when art, unlike humans, does not create within itself upper and lower hierarchies. But it can be argued that she has no such intention for she particularly mentions Ravi Varma’s own disregard for such discriminations. But through his life, he didn’t have to be a ruler, he could stay away from politics, and travel for days to other states, where he’d been called him knowing about his genius, and work away. He follows other customs of those times, marrying young at 18, having children. 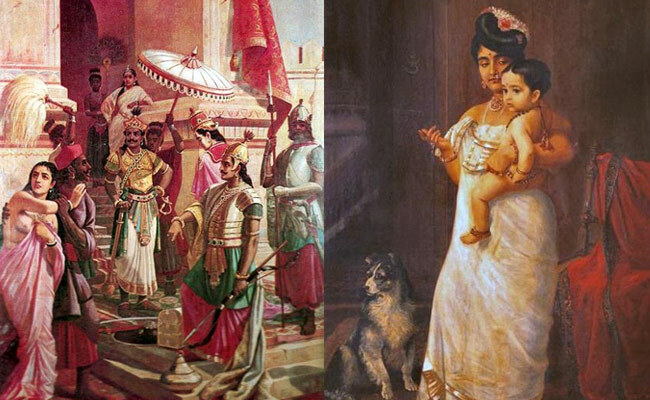 In fact, he had been a contender for the hand of the young princess of Trivandrum, as a 13-year-old. But he was rejected “owing to his ‘dark’ skin”. Another cruel irony of those times – here was a man who could create magic with colours and yet the colour of his skin would become a reason to reject him. But the rejection turned out to be lucky for if he had been chosen, the rules of holding an office and the discipline of palace life would have prevented his growth as an artist. You can see the quiet admirer in his great-great-great-great descendant, as Rukmini imagines how the colours must have spoken to him. She manages to bring alive the world Ravi Varma lived in, the times, the quests he would go on for, for the perfect face or image. As an artist herself, she finds it no difficult to leap into the technicalities of painting in between her narrations – you can find her own painting of the ancestor among his many works in the book. 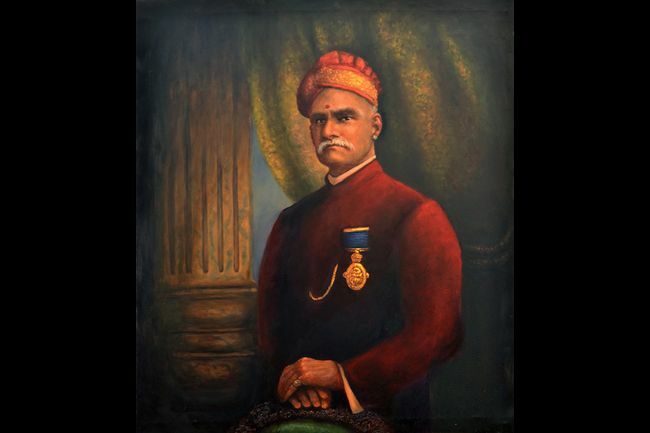 It is not possible to know Ravi Varma the person without going through Ravi Varma the artist. Even through the deaths of his dearest parents, visibly shattered as he was, the only activity he indulged in was painting. Rukmini goes back further into the past to tell how his mother Umamba didn’t have children for years until a ‘yakshi’ (female spirit) possessed her and upon leaving her body, blessed Umamba with a child – Ravi Varma. Rukmini doesn’t use words like ‘belief’ or ‘myth’, writing it all as the only truth that could have happened. “All the stories that I have heard from my great grandmother as a young girl created a wonderful aura around this person. He assumed a kind of prominence in my mind, shrouded in mystery. I wanted to go deep in, to know more about him. I used to sit and wonder what could he have been like. What did he think when he was mixing his colours?” she says in the interview. Rukmini puts those thoughts out in the book, the thoughts she imagines her great ancestor would have had. She also tells the stories behind some of his much-loved paintings. Jatayu Vadham was created using two models he found with the perfect features when the girl, his young relative, turned her face away in shyness – that became his Sita, hiding her face as Ravana, snatching her, kills Jatayu. Another painting - The Victory of Meghanada - is what Rukmini calls the finest of his works. In There Comes Papa, he paints his daughter Mahaprabha with her son. 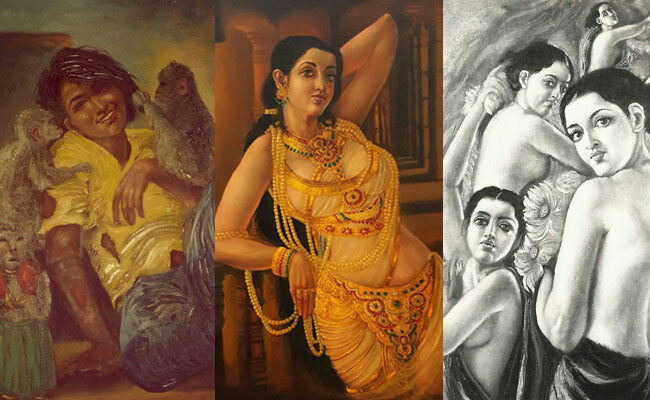 Rukmini writes that he used Mahaprabha's features as the main reference in his portrayals of women. In one of his notes that Rukmini found, it says, "I am very fond of my kochukutti. I looked at her and caught my breath. Her face! I suddenly realised how classically perfect were its proportions, the face I had been searching for, as a template." The hidden truth that the book is titled after has to be the notes Rukmini found 25 years ago, in her ancestor’s writing. She says that the core of the book is on the experiments Raja Ravi Varma took up to actualise his paintings. “The skin has innumerable shades. The more you are able to interpret it on the canvas, the more real it becomes. 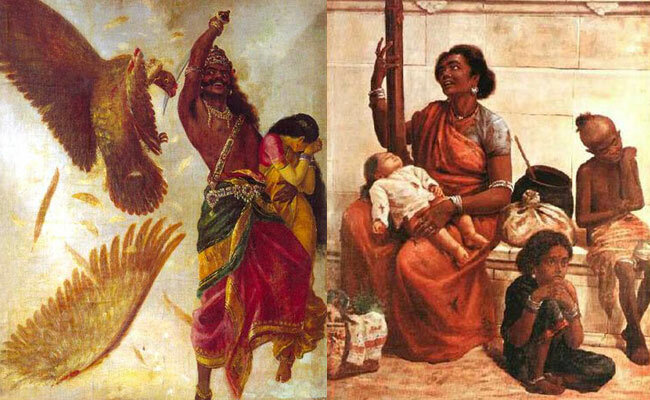 Ravi Varma was trying to infuse life through colours. The manner in which he did this was close observation. He realised that from nature, one can draw energies through colour,” she says.